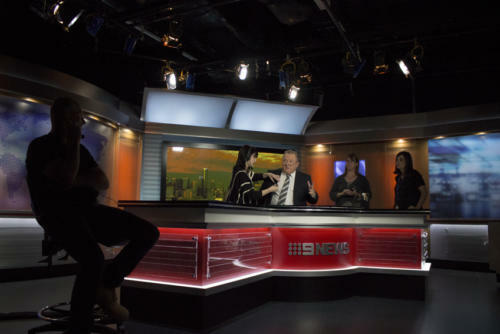 Having turned 70, newsreader Peter Hitchener shows no sign of relinquishing his grip on Channel Nine’s nightly news bulletin. Buffy Gorrilla tries to keep up. Peter Hitchener has agreed to meet for a chat – of all places, at his local gym. “Shall I come in my workout gear?” I ask. From the moment I heard Peter Hitchener did Pilates, the idea of ‘planking with Peter’ captivated me. It would be a blast if this seemingly down-to-earth celebrity would allow me to join him at the gym. When he said ‘Yes’, I was thrilled. And so, it is 8am on a Tuesday. The gym is Hitchener’s first stop. He is welcomed with smiles, handshakes and excitement. He mirrors the enthusiasm as he is greeted by the trainers. I cannot help but wonder, is Peter Hitchener really as nice as he seems? Hitchener looks as comfortable as one can upside down. I am in my workout gear and worrying my famous gym buddy might also require counselling. His shoulders are resting on the horseshoe-shaped cushion of a Yogacise exercise bench. He gradually lowers his legs, rolls out with his feet on a silvery Swiss ball. He is nearly horizontal. He rolls back and pulls himself up to vertical with no help from Donna, his personal trainer. He repeats this series, takes a water break and then gets back to it. He breathes steadily, breaks a minimal sweat and smiles. Hitchener has a core of steel that belies his 70 years. He breezes through a series of abdominal and oblique exercises. I flop and roll on a black mat next to him, thinking my youth will win out. Donna smiles. “It takes a lot to beat Peter in any stomach series,” she says. He moves onto somersaults landing on a thick red gymnastic mat. He springs up and begins the next prescribed exercise. He is agile and fearless, laughing throughout. Tuesdays are his “busy days”. After the gym session, which for Hitchener includes Pilates to help with “knee troubles after years and years of being addicted to tennis”, we are on the train to Nine’s Docklands studios. He is just a commuter. He blends in: black Nike sweatshirt, khaki chinos, Asics sneakers and Philip Stark reading glasses. He prefers to stand. He does not like it when other passengers offer to give up their seat to him. If people recognise him, there is no indication. As we ride, I watch as the news man’s iPhone 6 constantly displays push notifications. He is active on “Insta”; he Tweets, he Periscopes. He tells me about the most recent “Insta updates”. He is clearly ahead of his net-native colleagues with his Instagram knowledge. He hashtags. Some of his social media followers comment on his hashtags alone. Peter Hitchener is #stillgoingstrong. We are back at Nine, just across the road from Southern Cross Station. Hitchener dashes to get ready for his next engagement. He is in his third outfit of the morning, including colourful socks. We walk briskly to radio 3AW’s studios about 400 metres away to record Behind the Wheel, a podcast passion project bringing together Hitchener’s love of cars and an opportunity to reach a new audience. Hitchener was born outside Texas, Queensland. His father ran the family business, raising sheep and cattle. Peter and his younger sister, Wendy, lived for the times the creeks were in flood so they could avoid school. Sadly, the floods did not come as often as the Hitchener kids would have liked. Following his desire to act, he abandoned small town life after he won a scholarship to the National Institute of Dramatic Art. At the same time, he received a job offer at radio station 4BH in Brisbane. 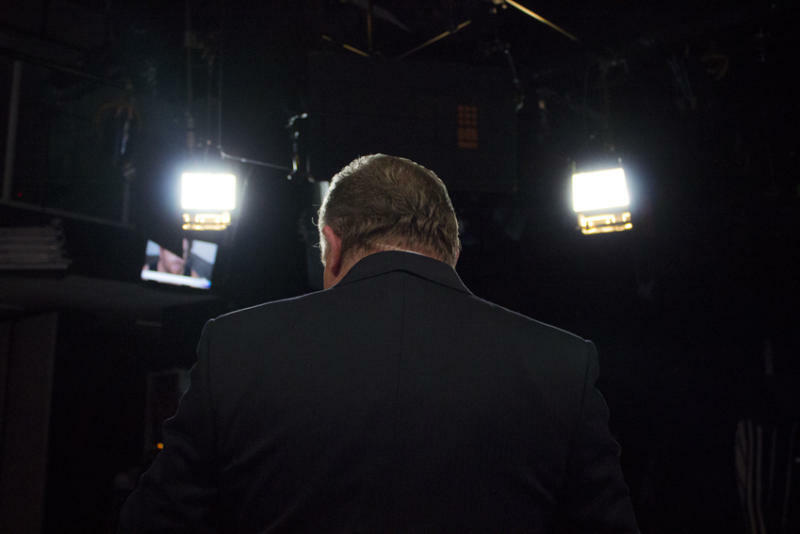 He took his passion for performing into the newsroom: a decision he does not regret. The Behind the Wheel studio is warm. Hitchener’s co-host, Chris Miller, moves quickly behind the control panel. Together, they review the cars they have been testing. Hitchener has been driving a Subaru Forester; Miller, a Hyundai Velostar. The pair run through stories like a race car uses tyres: the safest used cars, the best cars for pet owners, questions from listeners. Towards the end of the recording, Rhys Hawley, Hitchener’s assistant and co-ordinator, arrives with coffees, one black and one with sugar. Hitchener takes a sip and exchanges his coffee with Miller. Too sweet: he is off sugar. Next up is a 20-minute chat with 3AW’s Denis Walter. The pair host talkback about a selected topic. Today, it is mishaps at work, a subject Hitchener claims to know well. In 2009, a live broadcast was momentarily interrupted as viewers watched a seagull marching across the screen behind the newsreader. More recently, a coughing fit caused the almost unflappable news man to lose composure momentarily before Livinia Nixon glided in to take over the newscast. By now, I am regularly asking myself the same question. Hitchener remembers everyone by name as they cross paths throughout the day. There is Donna, Kieran, Daniel, Nicholas, Denis, Jason, Giancarlo, Steven, Steve, Anna, Theresa, Marty, Murph and Beansie. He recalls details about people’s children: Murph’s son is a pilot, Narrell’s son, Lachlan, “is just the sweetest”. Hitchener is willing to pose with an unphotogenic sandwich cookie Di Robertson’s mother baked because it would make her smile. He spends a commercial break looking for a particular breed of dog on his phone to show Rose Meredith from the wardrobe team. Nixon recalls the time a fan admired Hitchener’s tie at the Royal Melbourne Show. He took it off and gave it to him. Hitchener laughs remembering the story. He says he was self-conscious for the rest of the day because he was tieless in photos. I uncovered only one story of Hitchener having a momentary lapse of niceness. It comes from Nine presenter Jo Hall. 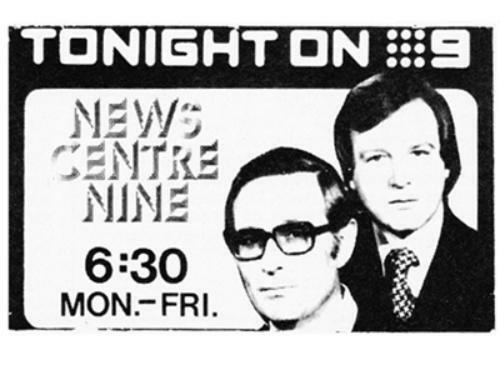 The Nine team – Tony Jones, Nixon and Hall – were shooting promos. Hitchener was supposed to be on set for the filming but was elsewhere recording a radio promotion. Someone asked Hall to get him back to the studio. “Any chance you can get back here to finish these [promos]?” she asked after locating him. There was a pause. Then came the terse comeback. For the duration of the shoot all he did was apologise. Hall returned home to countless emails. There were even flowers delivered to her house the next day. “That is the only cross word in 35 years, and it was not even that bad. That is the only time we have had any dissension between us at all,” she says with a laugh. It is six hours into our full-on Tuesday and I realise I have broken rule Number One of journalism: do not get attached to your interview subject. I have fallen under his spell. He notices the small things that I appreciate. The ‘W’ in NEWS on the studio desk was crooked and with a swipe of his pointer finger, it was straight again. Hitchener prefers to vacation where there is no time difference – jet lag slows him down – so he often heads to Japan. He is taking Japanese lessons. He loves an ice cream drink there: the enorme swirkle, which looks like a more exotic version of a Starbuck’s frappuccino. I want him to share with me how he manages to keep his thick high-def ready foundation off his shirt collar. Through two outfit changes fully made up, he leaves no trace. This makes him seem slightly other-worldly. His Tuesday goes and goes. He is in the studio, wearing another dashing combo, a blue shirt and blue tie. He charms two members of the Nine publicity team to Periscope with him. It’s to raise awareness for GO! Step for Gynae, which raises funds for gynaecological cancer research. Hitchener committed to taking 10,000 steps per day in September, as part of the challenge. He raves about his Fitbit and has the app on his phone. By 3.30pm he has racked up more than 8000 steps. 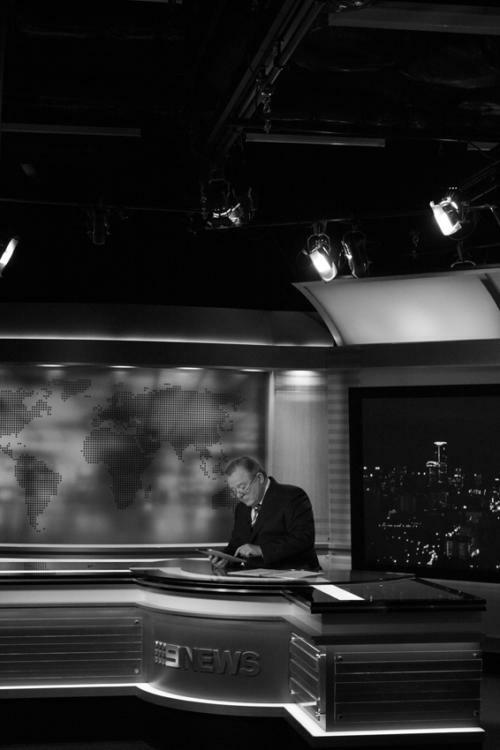 It is time for Hitchener to get news-ready. Like Superman, he rips away one shirt and tie to reveal another outfit. This time it’s a red tie and white shirt, his newsreader ensemble. He tapes that evening’s broadcast promos. He meets a group of new employees and students. He suggests individual pictures behind the news desk. 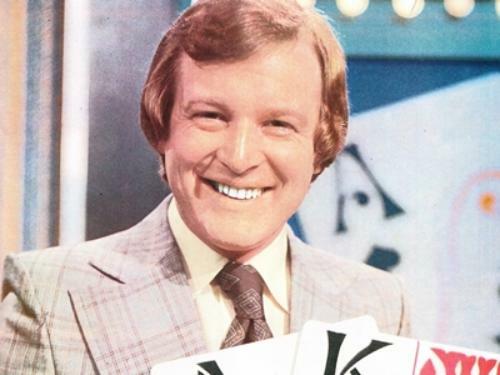 Hitchener’s first-ever TV broadcast was with the ABC in Brisbane. It was a Sunday night. It was at seven o’clock for half an hour. “I looked okay, but I was holding the papers up and you could see just at the bottom of the frame the papers were shaking because I was so nervous. “I still get nervous. Everyone does. That is part of it, but to a greater or lesser degree,” he says. Over the years the usually chipper Hitchener has delivered some emotional bulletins, “reporting news can be very confronting. Some of the stories you report on are just very upsetting. Those days come along and they are not days I look back on with any great fondness, but it’s part of the job. “I have an optimistic outlook, but there are bleak times as well and some of the stories just get to you. A newsreader is a filter for stuff, but it does build up,” he says without going into additional detail. He films that night’s news broadcast. He thanks everyone for their work. After that, he has another radio engagement. He will unwind by watching golf and will be in bed by 11.30pm. He is able to sleep in the next day, which means 7am. How many late nights and early starts does he see in his future? His current contract is reported to go until 2019, and Hitchener wants to keep on going. He clearly loves what he does. But has he considered who will succeed him if the time comes? After the bulletin ends, he escorts me to the door. He asks if I will be able to get home safely. I tell him if anything exciting happens to let me know. He laughs, shakes my hand, thanks me again and heads back in. Maybe we could go to counselling together (smiling/blushing emoji).